COLUMBUS, Ohio – The Division I and II boys basketball All-Ohio teams were announced Tuesday by a statewide media panel. The teams were selected by members of the Ohio Prep Sportswriters Association. Ohio Mr. Basketball will be announced later today, as will the Division III and IV All-Ohio teams. FIRST TEAM: Dane Goodwin, Upper Arlington, 6-foot-5, sr., 23.5 ppg; Jerome Hunter, Pickerington North, 6-7, sr., 21.0; Sincere Carry, Solon, 6-0, sr., 23.2; Alonzo Gaffney, Garfield Heights, 6-9, jr., 18.2; Jaret Pallotta, Massillon Jackson, 6-6, sr., 15.5; Mason McMurray, Stow-Munroe Falls, 6-8, sr., 14.6; Vincent Williams, Toledo St. John’s, 6-5, sr., 18.9; Darius Bazley, Cincinnati Princeton, 6-9, sr., 15.3; Jaxson Hayes, Cin. Moeller, 6-10, sr., 12.0; Darius Quisenberry, Huber Heights Wayne, 6-1, sr., 18.5. PLAYER OF THE YEAR: Dane Goodwin, Upper Arlington. COACH OF THE YEAR: Brett Norris, Hilliard Bradley. SECOND TEAM: JT Shumate, Newark, 6-6, sr., 21.2; Treauhn Williams, Reynoldsburg, 6-7, sr., 18.0; Ben Roderick, Olentangy Liberty, 6-5, sr., 24.3; Dale Bonner, Shaker Heights, 6-3, sr., 18.4; Christian Guess, Shaker Heights, 6-6, sr., 26.2; Collen Gurley, Akron Hoban, 6-2, sr., 15.2; Houston King, Toledo St. John’s, 6-4, sr., 17.0; Jackie Harris, Toledo St. Francis, 6-6, jr., 16.5; Bo Myers, Logan, 6-5, jr., 22.0; RaHeim Moss, Springfield, 6-4, jr., 16.2. THIRD TEAM: Jake McLoughlin, Dresden Tri-Valley, 6-6, sr., 12.2; VonCameron Davis, Columbus Walnut Ridge, 6-4, soph, 22.8; Devon Grant, Lorain, 6-1, jr., 21.0; Kaleb Martin, Green, 5-9, jr., 19.0; Delmar Moore, Warren Harding, 6-6, sr., 13.0; Kyle Jackson, Mansfield Madison, 6-6, sr., 20.3; Alek West, Sylvania Northview, 6-3, jr., 14.5; Branden Maughmer, Chillicothe, 6-2, Sr., 17.4; Samari Curtis, Xenia, 6-4, jr., 30.4; Jeremiah Davenport, Cincinnati Archbishop Moeller, 6-5, sr., 15.4. SPECIAL MENTION: Delshawn Jackson, Cleveland Central Catholic; Julius Brown, Westerville North; Sean Marks, Lewis Center Olentangy; Thomas Hickman, Westerville Central; Isaiah Speelman, Hilliard Bradley; Chris Jefferson, Cleveland Benedictine; Calvin Blair, Wooster; Jake Maranville, Uniontown Lake; Ryan Fries, Sylvania Southview; Riley Haubner, Cin. LaSalle; Matt King, Dresden Tri-Valley; Kade Ruegsegger; Ian Sexton, Dover. FIRST TEAM; Cameron Brooks-Harris, Zanesville, 6-7, sr., 20.5 ppg; Trey Singleton, Byesville Meadowbrook, 5-10, sr., 24.7; Jelani Simmons, Columbus Beechcroft, 6-6, sr., 20.0; Jerry Higgins, Cleveland Villa Angela-St. Joseph, 5-9, sr., 22.8; Dwayne Cohill, Parma Heights Holy Name, 6-2, sr., 21.9; Pete Nance, Richfield Revere, 6-10, sr., 21.0; Austin Rotroff, Wauseon, 6-9, sr., 14.6; Kollin Van Horn, Proctorville Fairland, 6-8, sr., 16.0; Terry Durham, Cincinnati Woodward, 6-5, 24.0; Myles Belyeu, Trotwood-Madison, 6-4, sr., 25.2. PLAYER OF THE YEAR: Pete Nance, Richfield Revere. COACH OF THE YEAR: Chad Burt, Wauseon. SECOND TEAM: Justin Heacock, New Concord John Glenn, 5-11, sr., 15.7; Taevion Kinsey, Columbus Eastmoor Academy, 6-5, sr., 19.5; Luka Eller, Mentor Lake Catholic, 6-5, soph., 20.2; R.J. Sunahara, Bay Village Bay, 6-6, sr., 22.8; Mason Lydic, Peninsula Woodridge, 6-1, sr., 22.5; Scott Walter, Akron St. Vincent-St. Mary, 5-10, sr., 12.0; Keith Williams, Sandusky, 6-1, sr., 18.8; Cade Stover, Lexington, 6-5, jr., 18.0; Luke Thomas, Proctorville Fairland, 6-2, Sr., 14.0; Joey Edmonds, Cin. Wyoming, 6-0, jr., 21.2. THIRD TEAM: Connor McGuire, Gnadenhutten Indian Valley, 6-0, sr., 13.2; Garrett Tipton, Columbus Hartley, 6-5, sr., 16.5; Alex Sulka, Chardon, sr., 6-3, 27.8; Aaron Loines, Cleveland Glenville, 6-4, sr., 17.0; Matthew Francesconi, Tallmadge, 6-3, sr., 20.6; Daniel Unruh, Elida, 6-2, sr., 17.1; Logan Swackhammer, Chillicothe Unioto, 6-2, sr., 18.2; Colin Woodside, Lancaster Fairfield Union, 6-6, sr., 15.6; Amari Davis, Trotwood-Madison, 6-4, jr., 21.2; Jabali Leonard, Dayton Meadowdale, 6-0, sr., 23.0. SPECIAL MENTION: Connor Wright, Minerva; Caden Arbaugh, Cadiz Harrison Central; Nate Voll, New Philadelphia; Justin Shipman-Curtis, Columbus East; Datrey Long, Columbus Beechcroft; Shannon Stanley, Bexley; Kayin Derden, Columbus DeSales; Hayden Kanicki, Ashtabula Edgewood; Braeden O’Shaughnessy, Poland; Brandon Wahl, Louisville; Connor Tamarkin, Warren Howland; Brandon Haraway, Norwalk; Chance Barnett, Bellville Clear Fork; Ethan Heller, Thornville Sheridan; Giovanni Santiago, Cin. Hughes; Landen Angel, Hamilton Ross; Isaac Beam, Chillicothe Zane Trace; Zach Loveday, Gallipolis Gallia Academy; Naylan Yates, McArthur Vinton County; Clayton Howell, Waverly; Josh Huffman, Vincent Warren. HONORABLE MENTION: C.J. Charleston, Gates Mills Gilmour Academy; Luke Frazier, Mentor Lake Catholic; Dechlan Kirincic, Gates Mills Gilmour Academy; Luke Howes, Fairview Park Fairview;, Brody Kuhl, LaGrange Keystone; Kevin Peterson, Parma Padua Franciscan; Javon Todd, Lorain Clearview; Connor Leppla, Cambridge; Kobe Mitchell, Cadiz Harrison Central; Cade Williams, Gnadenhutten Indian Valley; Davis Black, Byesville Meadowbrook; Aronde Myers, Zanesville; Craig Bober, St. Clairsville; Gabe Roach, East Liverpool; Joby Pfeil, Vermilion; Trey Ruhlman, Bellevue; Jacoby Kelly, Van Wert; Jaron Sharp, Kenton; Brooks Gype, Wauseon; B.J. Patrick, Mansfield Senior; Mack Anglin, Marengo Highland; Payton Collins, Columbus Hartley; Dylan Herbert, Delaware Buckeye Valley; Ther’Ron Jennings, Columbus Beechcroft; Zach Sawyer, Columbus Watterson; Treohn Watkins, Columbus South; Mike White, Columbus East; Lucas Thompson, Lancaster Fairfield Union; Darby Tyree, Wash. Court House Miami Trace; Cameron Carter, Wash. Court House Miami Trace; Isaiah Howell, Proctorville Fairland; Brandon Kennedy, Chillicothe Unioto; Logan Maxfield, Athens; Jake Speakman, McArthur Vinton County; Grant Heileman, Thornville Sheridan; Cooper Donaldson, Jackson; Jonathan Allen, Dayton Dunbar; Damonte Bailey, Dayton Ponitz Career Technology Center; Xavier Johnson, Cin. Summit Country Day; Evan Prater, Cin. Wyoming; Colin Shaw, Cin. Indian Hill; Chris’seon Stringer, Cin. Taft; Scott Wormald, Canal Fulton Northwest; Cyler Kane-Johnson, Niles McKinley; Michael Huberty, Alliance Marlington; TJ DeShields, Beloit West Branch; Mitch Davidson, Salem; Braden Tucker, Streetsboro; Jonathan King, Akron Buchtel. 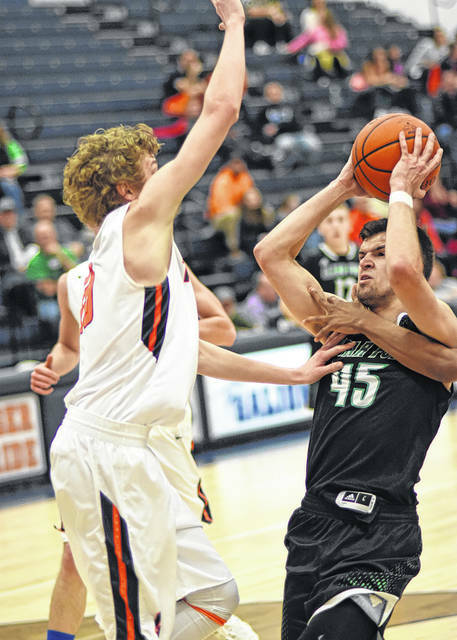 Clear Fork’s Chance Barnett battles a couple Galion players to get off a shot during a game this month in Willard. Barnett was named to the Division II All-Ohio Special Mention team by members of the Ohio Prep Sportswriters Association.